SwipeSelection was a concept introduced to show a better way to edit text on the iPad, and in less than a day it became a reality thanks to the jailbreak community. 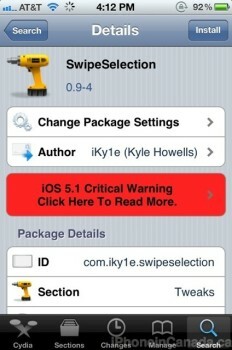 The tweak is free in Cydia and is also available for the iPhone. After installing SwipeSelection via Cydia, the feature is built right in to iOS. To edit text and navigate the cursor, just swipe your finger left or right. Easy enough. To highlight, you need to tap the shift key, then swipe left or right over the text you want highlighted. Overall, the tweak works exactly as described. 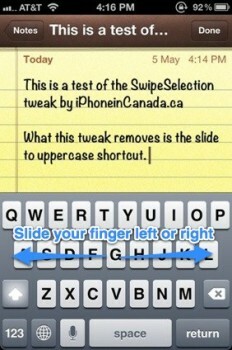 One immediate downside I noticed was the tweak removes the slide to uppercase shortcut. You know, where you tap the shift key, hold and slide to the letter you want capitalized? Since SwipeSelection utilizes the shift key to highlight, it interferes and takes away this handy shortcut, which will be annoying to some. 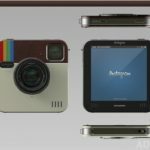 Also, the tweak would be even better if you could navigate the cursor up and down as well. Overall, SwipeSelection is pretty powerful if you edit a lot of text on the iPhone, as the side to side swiping is reminiscent of RIM’s well-known trackball that can quickly move your cursor anywhere. How do you like SwipeSelection so far?